Arms. Or. a fess dauncettie, a lion rampant, in base, sable. Crest. A lion's head, erased, argent, guttee de sang. Motto. Si Deus nobiscum quis contra nos. The Morris family have been involved in the affairs of Galway since 1485, and are one of the Tribes of Galway by virtue of having supplied numerous Mayors & Sheriffs to the City. They had seats in Galway City and in Spiddal. 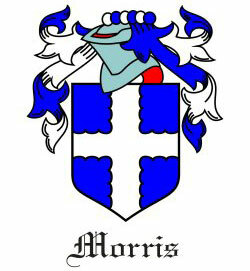 The Morris family first settled in Galway, in 1485, the name was then written Mares. It was later changed to Morech, and finally assumed its present form of Morris. Nothing in particular occurs on record relating to this family. Except, that several of its members served the offices of Mayor and Sheriff of Galway City. They were also active and distinguished in the affairs of the former corporation.